EVERETT - Everett firefighters responded to a fire Monday morning, October 8, shortly before 8 a.m. at the Port of Everett Marina, 700 14 Street. The second-alarm fire damaged five boathouses in the covered boat marina and two boats. Initial calls to 9-1-1, which started coming in at 7:49 a.m.; reported thick, heavy black smoke coming from the covered boathouses at the Central Docks. 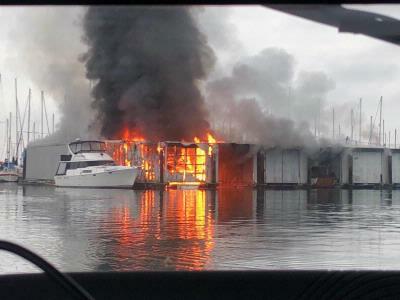 As fire units responded, flames could be seen from a distance, and people who were already in the area of the fire were reporting the flames were topping the roof of the covered boat marina at the G-Dock. As firefighters worked hard to extinguish the fire from the dock, Marine-1, staffed with fire and police marine-trained personnel, attacked the fire from the water. Other firefighters quickly moved adjoining boats from their boathouses, saving them from the fire. They also ensured the fire did not spread to any other boathouses or extend into the rest of the marina. The fire was fought with water and an environmentally friendly and readily biodegradable fire suppression foam called Novacool. The fire was tapped at 9:07 a.m.
No boats sunk during the firefighting efforts. One badly damaged boat was lifted out of the water with the help of the Port of Everett, and firefighters were able to further extinguish the fire and address any hotspots that flared up. In total, the fire damaged five boathouses, two are considered extensively damaged. A 1979 36’ fiberglass hull, troller type boat is considered a total loss. A second boat, specifications are unknown at this time, was assessed at being 10% damaged. Fire investigators are in contact with the registered owner of the 36’ troller who stated he was living aboard the boat. He was not injured in the fire. There were no reported injuries to firefighters or civilians. Mutual aid was provided by the Everett Police Department, South Snohomish County Fire and Rescue, Marysville Fire District, Snohomish County Fire Districts #4, #7, and #22, Naval Station Everett, and personnel from the Port of Everett. There were over 70 fire personnel on scene of the fire. The cause of the fire is under investigation. Information will be released as it becomes available.